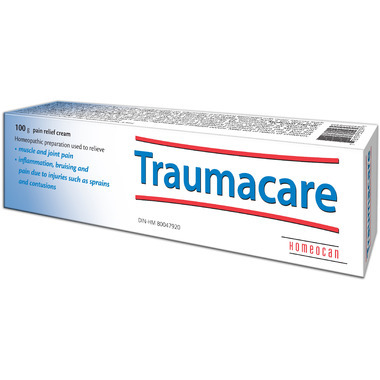 Homeocan Traumacare Pain Relief Cream helps relieve muscle and joint pain, inflammation and bruising associated with minor injuries such as sprains, and contusions. Love this product. We use it on bumps and scrapes, bug bites and sore muscles. Have repurchased frequently. First time buying it from Well. This product works quickly, has no odour and you don't need a lot. A friend let me try hers and she raved about. Other highly advertised similar products did not work like this did.